The Denver Nuggets are coming off of their most disappointing game of the entire season in a 129-103 loss to the Detroit Pistons on Monday. Granted the Nuggets were without three of their starters, but they came out with no energy it ended up being a bad showing. Denver had a chance to get back on track in Brooklyn where the Nets welcomed in the Nuggets to the Barclays Center on Wednesday evening on a losing streak of their own. The Nets came into the game on a three-game skid, but they are having a surprisingly good season and were looking to turn things around. The Nets won the first meeting against Denver 112-110 behind a Caris LeVert buzzer beater and made it a season sweep against Denver on Wednesday with a 135-130 win pushing the Nuggets to a 14-13 record on the road. With a two-game losing streak, the Nuggets now sit a game and a half behind the Golden State Warriors. With that, I give you the good, bad and ugly. In a game that the Nuggets showed little to no resistance, it is a bit difficult to find positives besides the play of the starting bigs for Denver. Denver made it a point to attack the smaller Brooklyn lineup early on as they finished with 24 of their 35 first-quarter points inside the paint. That was one of the main reasons that the Nuggets were up 35-30 after the first 12 minutes, but the other two reasons came from the play of both Jokic and Mason Plumlee. Nikola Jokic had himself another incredible showing despite the loss and recorded his 10th triple-double of the season with a stat line of 25 points, 14 rebounds, and 10 assists in 33 minutes of playing time. There seemed to be a bit of a revenge game narrative for Plumlee. Plumlee was drafted by Brooklyn and spent his first two seasons with the Nets and he came out and had one of his best games for the Nuggets against his former team. Plumlee started the game out hot as he finished the first quarter with 14 points, four rebounds and recorded two blocks as well. His early play led to him finishing the game with a new season-high in points of 24. 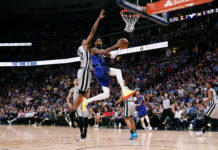 He also recorded six rebounds, three blocks and a steal as he played with plenty of effort and provided Denver with the energy that they were lacking. He was aggressive down low and active from the opening tip as he applied pressure all game. 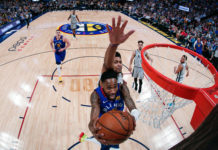 He was in foul trouble for a good portion of the night and eventually fouled out, but he set the tone that the Nuggets have been lacking in first quarters this year as he stepped in for the injured Paul Millsap. When the Nuggets were asked why they lost against Detroit, Malone and his players said it was because they were not ready to play. But taking a deeper look at Monday’s game will tell you it was in the second quarter that the game was lost. Denver lost Monday’s game to Detroit in the second quarter 34-19 by allowing Detroit’s big men to establish themselves down low and take over the game from the inside-out. In Brooklyn, it was the same issue for Denver as they again were dominated for the second quarter frame. The Nuggets lost the second quarter 42-25 and went into halftime with a 12-point deficit that they never got out of. In the second quarter the Nuggets got sloppy and careless with the ball. Denver committed five turnovers and the Nets ran with them and converted. 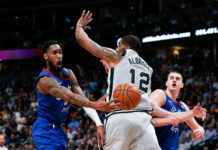 Denver’s defense has also continued to snowball as they had issues with finding the open man and running shooters out of their spot as Brooklyn hit seven 3-pointers in the quarter alone which ended up opening the flood gates for the Nets. Denver led by as many as 14 points early on in the first quarter, but that lead disappeared quickly as Brooklyn went on multiple runs and opened things up with another big second quarter. Denver must limit turnovers, come out with energy and get back to being a defensive team or else they will be in jeopardy of allowing this losing streak to become three-straight games. The 3-point line was not good to Denver on either side of the court for a second-straight game. Denver has been having a difficult time with defending the 3-point line as of late. Two days before taking on the Nets, they allowed Detroit, the worst 3-point shooting team in the league, to knock down 16 3-pointers. 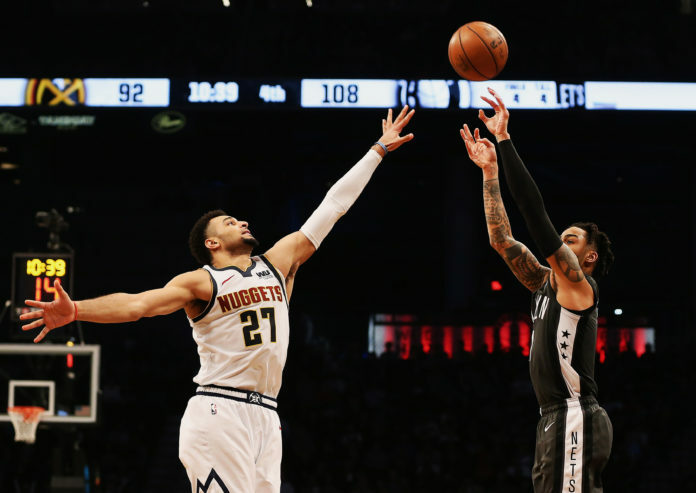 The Nuggets followed that disappointing display up by being outscored by 18 points from beyond the arc by Brooklyn and, to make matters worse, they allowed plenty of those shots to go uncontested. Brooklyn came into the game with offensive issues after scoring under 95 points in two-straight games, but with a spark from deep they were able to put up 135 points on the Nuggets. The Nets put on a shooting clinic as they finished with 19 3-pointers on the night shooting 55.9 percent from the field. Denver did not close out, get through screens or run shooters off of the 3-point line and were punished as a result. D’Angelo Russell was scorching hot from deep as he went 6-9 from beyond the arc. He finished with 27 points on the night. Trevor Graham, who is not known for his perimeter shooting, knocked down four 3-pointers of his own and others got in on the action. Denver must find answers and fast.